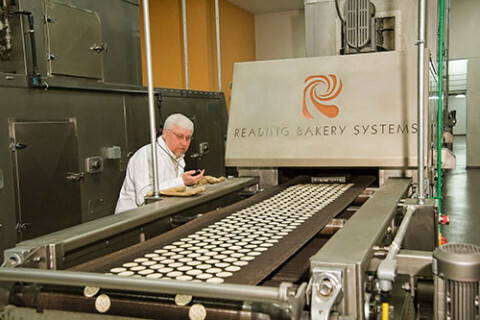 Reading Thermal, a Reading Bakery Systems brand, was founded in 1999 with the philosophy that innovation should be simple, reliable, and accessible. A team of experts in heat transfer developed the SCORPION® Data Logging Measurement System with these directives in mind. The SCORPION® idea was first conceived by Fylde Thermal Engineering of Macclesfield, England, back in 1988. At that time a 16 channel data logger and a temperature array was the complete system, with data analysis performed by an early version of MS Excel. Today the SCORPION® 2 is a complete hardware/software measurement system, with a 32 input channel data logger and a group of compatible sensors helping process engineers, quality control engineers, and oven manufactures understand the four key parameters in any thermal process: 1) Temperature [Air, Band, & Product Core], 2) Air Velocity, 3) Energy Transfer, and 4) Humidity. With an eye on customer needs, Reading Thermal developed the SCORPION® Profiling Service to help customers solve baking, drying, and cooling problems. And to help bring customers in compliance with OSHA regulations the Oven Safety Inspection Program was developed. Reading Bakery Systems (RBS) is a world leading manufacturer of bakery equipment, providing innovative process solutions and support for the snack food industry. The Reading Bakery Systems brands – Thomas L. Green, Reading Pretzel, Exact Mixing and Reading Thermal – offer production lines capable of producing a wide range of snack products, Continuous Mixing solutions and oven profiling and consulting services. At RBS, we understand the dynamic nature of the global food industry, and we work side-by-side with our customers to meet their process and product challenges with innovative thinking and high quality systems and components. Our experienced people apply decades of expertise to help customers create successful baked snack products. We serve our customers as a proud member of the Markel Food Group. With the combined resources of Reading Bakery Systems, AMF Bakery Systems, Tromp Group and Solbern, the Markel Food Group offers a wide and growing portfolio of high quality solutions for snack foods, breads and buns, pizza, pies, pastries, and other food products.